Overview The appendix is a normal true diverticulum of the caecum that is prone to acute and chronic inflammation. 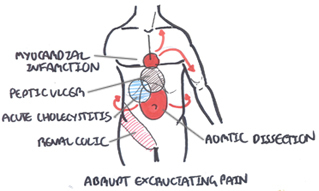 Acute appendicitis is the most common surgical emergency. Lifetime risk: 1 in 15 people. Can occur at any age but peak 10 – 30 years. Slightly more common in males. 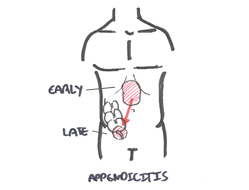 Acute appendicitis is rare before age 2 as the appendix is cone shaped with a larger lumen. Appendectomy (appendicetomy): Surgical removal of the appendix. A standard treatment for appendicitis. A ruptured appendix is considered a medical emergency. Appendicetomy can be either done open or laproscopic. 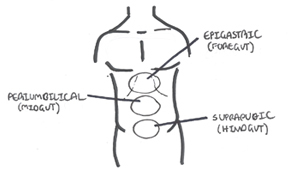 Clinical Presentation Classically periumbilical pain that moves to the right iliac fossa. Anorexia is an important feature; vomiting is rarely prominent – pain normally precedes vomiting in the surgical abdomen. Constipation is usual. Diarrhoea may occur. Remember For female patients rule out ectopic pregnancy and ectopic rupture. FBC with WCC differential are elevated ↑PMN. Urine β-HCG is done to rule out pregnancy or ectopic. Ultrasound may help, but the appendix is not always visualized. CT scan has high diagnostic accuracy and is useful if the diagnosis is unclear: it reduces -ve appendicectomy rate but may cause fatal delay. Prompt Appendicectomy. Laparoscopy has diagnostic and therapeutic advantages. It is not recommended in cases of suspected gangrenous perforation as the rate of abscess formation may be higher. Prevent Infection – Continue Antibiotics: Metronidazole + cefuroxime. Inspect incision sites for signs of infection. Restore Bowel Function – Clear liquid diet on same day of operation (if no nausea and vomiting). Commence regular diet the next day as tolerated. Prevention of DVT – Commence physical activity as soon as possible. Most frequently found incidentally found in the appendix postappendicectomy. Comprise 85% of all appendiceal tumours. If <1cm in diameter, it is considered cured by appendicectomy. If >2cm in diameter (rare), investigate for spread to sentinel lymph nodes. Managed by hemicolectomy.